Last time I posted, I told you about Jacob Miller, my hero in A Season of Change, and how I “met” him, along with the village of Pinecraft. The place wiggled its way into my heart and hasn’t left. The village itself became a major character in A Season of Change. So this time, I’d like to introduce you to Pinecraft. Pretend we’re flying into Tampa, Florida, and hopping into our rental car and heading an hour or so south, to Sarasota. Pinecraft has the only Amish-run post office in the U.S. Here’s the local message board (think Craigslist). Even before you turn onto bustling Bahia Vista Avenue, you’ll know you’re not in a place where you’d expect to find an Anabaptist settlement. You’re in Sarasota, Florida, a lively city of 52,000 on the Gulf Coast. Breathe in the fresh air, bask in the sunshine, and see the palm trees wave here and there in the breeze. The sandy beaches of Siesta Key are but a short fifteen minutes’ drive away. Once you reach Bahia Vista, though, you’ll start to see something interesting. Bicycles here, there, everywhere, and many more in the winter time. Their riders? Amish or Mennonites, visiting from regions north, places like Pennsylvania, Ohio, Illinois, Indiana, and other locations. If you visit Pinecraft, you’ll learn the village’s heyday runs from November until around Easter time, during which time period the population swells to three or four thousand. The village’s boundaries are about three-fourths of a mile west to east, and about one-half mile north to south at its widest points. Translate: That’s a lot of Anabaptists all in one place. How do the Amish and more conservative Mennonites get to Pinecraft, if they don’t drive? I’m glad you asked! 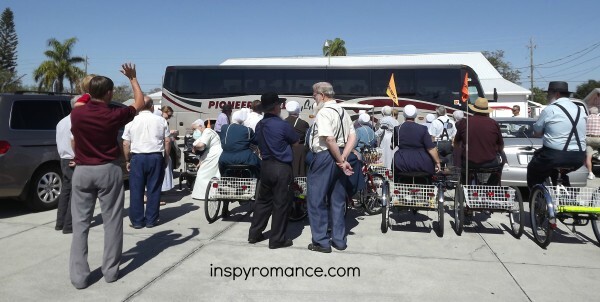 They arrive mostly via charter buses on the Pioneer Trails bus line, which has stops in various Amish and Mennonite communities. One of the highlights of village activities is waiting to meet the buses, which arrive at the Mennonite Tourist Church. Hooray, the bus is here! The bus also delivers The Budget newspaper every week, straight from Sugarcreek, Ohio. The hotspots in Pinecraft include places like Yoder’s Restaurant (featured on the show “Man Vs. Food” and famous for its pies), an ice cream shop called Big Olaf’s, along with other establishments like Village Pizzas by Emma and Der Dutchman Restaurant. When you step into Pinecraft, toss out your preconceptions about the Amish and Mennonites. Oh, yes, they are still Plain. You’ll see Old Order Amish ladies from Lancaster County, their black aprons fastened with straight pins. You’ll see the older men, their long beards waving in the breeze, much like the Spanish moss does from the nearby trees. They might be Plain, but there aren’t any wood stoves or homes without electricity in Pinecraft. Since the majority of those who stay in Pinecraft are visitors, they’re permitted to stay in homes and small apartments that have electricity. There are several Amish churches in Pinecraft itself, two Old Order and a New Order church, along with the Mennonite Tourist Church and nearby Pine Grove Mennonite (which I attended when I visited the village). You’ll see all kinds of head coverings among the women, too. Some will be small, lacy coverings that remind one of a doily. Others wear the sheer, heart-shaped kapps of the Old Order. Still others wear a white, starched, pleated covering. “By their coverings, ye shall know them,” one of my Pinecraft village friends said when we had a discussion about head coverings (you won’t hear them called “kapps” much in Pinecraft). But not all people attached to Pinecraft “look” Plain. There are more liberal Mennonites who live in the area as well, and like other ladies, some even wear their hair short and wear capris, or even shorts. The men are having a smokin’-hot bocce game in Pinecraft Park, measuring distances down to the inch to see who wins. In Pinecraft during the winter, there’s always something going on—an impromptu singing at a local home, quilting at the Old Order Amish church, a yard sale. You can buy fresh oranges or grapefruit from the neighbors, or purchase baby Swiss cheese imported from Holmes County, Ohio. People find out about the singings via word of mouth or by notices posted on light poles throughout the neighborhood. Pinecraft Park is a hubbub of activity from morning until late night, with a playground for the kiddos, fishing in Phillippi Creek. 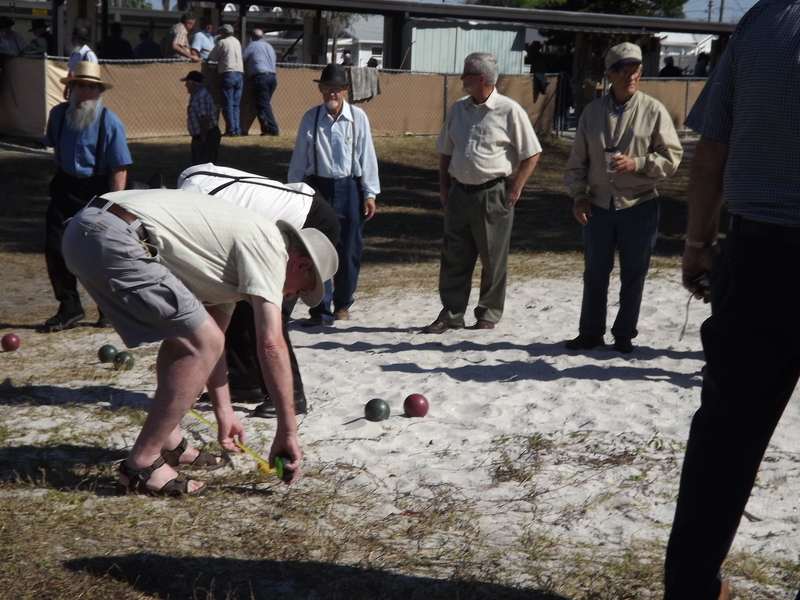 You’ll hear the clank-clank from the shuffleboard court, the grunts and discussion of men playing bocce (they measure to the nearest inch!). The youth play volleyball at the court—if they’re not at the beach nearby, that is. Siesta Key Beach, voted the Best Beach in America, isn’t far away. The girls love to change out their sturdy plain shoes for snazzy flip-flops and they stock up on the suntan oil to get a tan before heading back north. Is is possible to be Plain in the middle of a thriving, worldly city? Yes, and they do it in Pinecraft. But it’s not without its dangers, according to some. There are a few communities and Plain church groups that do warn their people about the distractions from being so close to the world. I hope you’ll stay tuned to the news page, or find me on Facebook – after A Season of Change releases officially on May 20, there will be a number of giveaways, events, and I’ll be doing a live chat in June. “Mennonite Tourist Church” <– Somehow, that just cracked me up! I love Pinecraft. 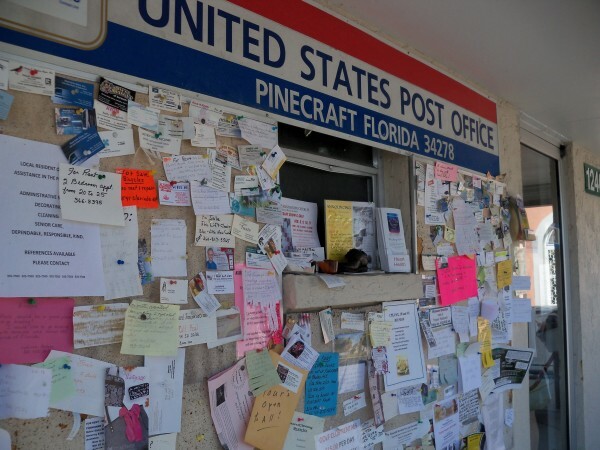 When in Fort Myers during the winter, we always drive up to Pinecraft to eat a good meal and do a bit of shopping. Your article is fascinating! It is a special, unique place, isn’t it? Thanks for stopping by! Very interesting and entertaining article. Would love to visit there one day. It was so interesting to visit, and fun! thanks for stopping by. I’d heard of such a place in Florida, but never really read the specifics. Thanks for the interesting blog. You’re welcome, Kay! Thanks for stopping by and commenting.